If you celebrate Christmas in your home as a holiday tradition, you may be concerned about your toddler disturbing the Christmas tree and potentially injuring themselves in addition to damaging some sentimental ornaments. Depending on how your Christmas tree is set up in your home, it may fall down or be hazardous to your toddler’s health if ornaments or pine needles are eaten. If you are a concerned parent, there are steps you can take to protect the Christmas tree from your toddler and keep your toddler safe from any potential hazards that may occur. I know I have heard the story of when I pulled down the whole Christmas tree down with ornaments (some glass) shattered on the floor and me crying in the middle of it. Luckily I was OK and didn’t get hurt. When my kids were young we would either be running after the kids if they headed towards the tree or would block off the tree with furniture. Safeguard Toddlers from the Christmas Tree with a Playpen or Furniture: Place a thin Christmas tree in a large playpen or surround a fuller tree with an expandable fence. Babies R Us Play Yard is a circular, indoor fence that can surround a tree and keep it safe from little hands. On Christmas morning, gifts contained inside the fence will be safe from excited toddlers and preschoolers until the parent gives the okay to open presents. Another way is to block it off entirely with furniture. While it may not be the most attractive scenario, it might prevent accidents. 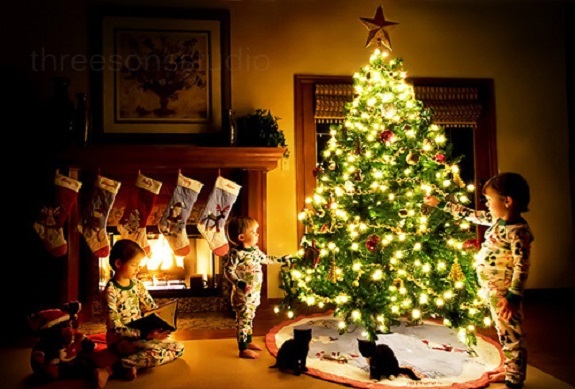 However, be careful about arranging furniture in a way that will encourage your child to climb on it to reach the tree. Use a Table-Top Holiday Tree: Consider scaling back the Christmas tree and using a smaller, table-top tree. The tree can be placed up on a table and will be out of reach of crawling babies and young toddlers. Table-top holiday trees have the added benefit of taking up less floor space. Presents can be stacked under the table on Christmas morning, freeing up more floor space for young children to play. Anchor the Christmas Tree to the Wall: A hook can be screwed into a wall stud and the holiday tree can be secured to the hook with fishing line or sturdy string. For extra security, two or three hooks can be used to anchor the tree at several points down the length of its trunk. It will be impossible for a toddler to pull a securely anchored tree over onto himself. Toddler-Proof Christmas Tree Ornaments: This is the time to put aside the fragile glass and ceramic holiday ornaments, or at least put them up high on the tree away from exploring toddlers. The bottom half of the tree should be decorated in paper, plastic, cloth or yarn ornaments. Avoid ornaments that have small pieces that could be a choking hazard. Instead of metal ornament hooks, loop the ornaments on the tree by the string. Eliminate Lead Dangers: A baby proof Christmas tree should not contain lead. Some artificial trees and Christmas lights contain the harmful substance. If you have a child it is wise to find out if your Christmas items contain lead. Even artificial trees end up loosing their “needles,” and you don’t want lead from the tree to end up in your child’s mouth. Christmas lights should be hidden well within a baby proof Christmas tree. Try to avoid leaving the string of lights exposed where your baby could easily grab it and chew it. This can cause electric shock or lead exposure. Give Inquisitive Toddlers Some Tree Exploring Time: Some particularly impulsive toddlers will have a hard time staying away from the tree despite all parental precautions. Give your child some supervised time to explore the safe ornaments on the bottom of the tree and to feel the bristly pine needles. Enlist your child’s help in decorating and allow some time to rearrange ornaments daily. Don’t forget to have a Happy and Healthy Holiday. If you have some other child proof suggestions for the holiday, leave them in the comments section below.